The National Media Museum’s exhibition The Dawn of Colour: Celebrating the Centenary of the Autochrome opened today. 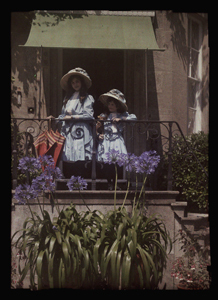 The exhibition is sponsored by N.M. Rothschild & Sons, Lionel de Rothschild (1882-1942) having been an enthusiastic Autochome photographer, 700 of whose Autochromes are held by the Rothschild Archive. The web site is beautiful to look at, with numerous examples of Autochromes and some welcome biographies of the photographers. It is good too on the technical details, with some downloadable PDFs including a 1908 instruction booklet. And the exhibition book, on the Rothschild collection, promises to be a treasure. There’s also information on Auguste and Louis Lumière, inventors of the Autochrome process as well as the inventors of the Cinématographe.